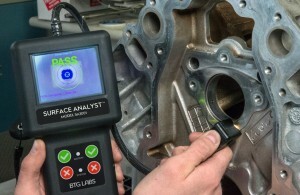 The Surface Analyst™ 3001 & 2001 are hand-held non-destructive portable contact angle meters for quantifying levels of surface preparation from the lab to the factory floor. If you bond, paint, seal, coat print or clean, you probably experience problems getting what you apply to reliably stick to your surface. The Surface Analyst, widely used in the Automotive, Aerospace, Medical Device Manufacturing, Packaging & Electronics industries works in a two second measurement cycle. A small droplet of water is created on the surface from a pulsed stream of micro drops, with a single button operation the instrument gives an immediate contact angle calculation or pass/fail indication from the drop diameter. The results correlate directly to a material’s cleanliness and the potential to form a strong bond with an adhesive or coating. SA3001 – a handheld, factory floor instrument with a range of interchangeable and tethered measuring heads for difficult to access locations making it the ideal solution for a wide range of applications. 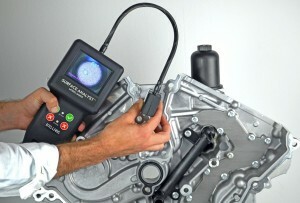 SA2001 – the entry-level inspection instrument with a pivot head for manufacturers and users of flexible film for whom critical film surface requirements mean the difference between success and failure. Various “add on” features are available for this model. Fix Adhesion Problems – the quantitive inspections of the Surface Analyst are the first step to taking control of your adhesion process. Using the Surface Analyst, inspect material surfaces and map where surface condition has the opportunity to change to get to the root cause of adhesion failure. Get Ahead of Adhesion Problems – Developing a new product and need confidence in your adhesion process? Use the Surface Analyst instrument to implement surface preparation processes and specifications to control and predict quality bonds during manufacturing. 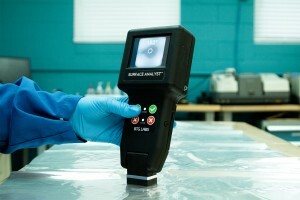 Fast – in 2 seconds you can determine if your part is ready to bond, paint, seal, coat, print or is clean. Easy – put the Surface analyst into production on the factory floor with as little as 15 minutes of training. 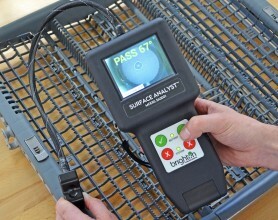 Accurate – a precise, repeatable measurement is delivered to the user, non subjectivity involved. 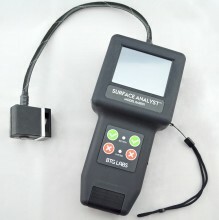 Non-Destructive – The Surface Analyst uses 1.5mL of highly purified water to take a measurement. Pass/Fail Mode – Notifies you if the measurement is within your predefined Pass/Fail range. Optional Dyne Mode – Displays results in dyne/cm (mN/m) which is a commonly used measurement scale (this mode is a chargeable option). Dyne mode available which will deliver results in dynes/cm (mN/m).